In my search for titles I felt worthy to be included on my list of “Books Every Christian Should Read,” one that came to my attention several times was Orthodoxy by G. K. Chesterton. 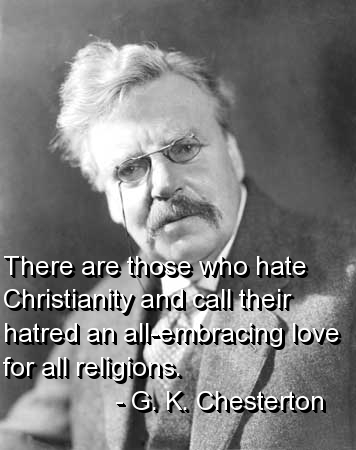 As an English major, I had, of course, heard of Chesterton and knew that he was a literary pal of C. S. Lewis, J.R.R. Tolkien and Dorothy Sayers, but I had never read any of his writings. He was a Roman Catholic, so his brand of religious orthodoxy is Catholic, which Protestant readers need to keep in mind. I decided to give Orthodoxy a try, found a free audio version of it to load onto my iPod, and proceeded through it. I have to admit it wasn’t the easiest text to listen to – harder than an audio novel – and I probably would get more out of it if I were to get a hard copy and read it again someday. Some parts I found to be interesting, insightful, and even humorous, while other parts sort of “went in one ear and out the other,” literally. I didn’t appreciate Chesterton’s derogatory remarks aimed at Calvinism, of which I am an avowed adherent. What to do – shall I include Orthodoxy on my list of recommended reading or leave it off? And how do I write a decent, honest review of the book, when I didn’t highlight or take notes while reading it, and I don’t have a hard copy handy to go back through (nor, I confess, a great eagerness to do so)? Then I came upon an article by theologian and author John Piper, a Calvinist, which reminded me of the positives that can be taken away from Orthodoxy and put my mind a little bit at ease regarding Chesterton’s negative comments about Calvinists. So, I decided to take the easy way out here. Instead of writing my own review, I submit to you Piper’s article, “The Sovereign God of ‘Elfland’ (Why Chesterton’s Anti-Calvinism Doesn’t Put Me Off).” After reading this article, you should have a little taste of what to expect, and it might be enough to help you decide if Orthodoxy is a book you want to explore for yourself. However, while there is some value to be found in it, I decided that Chesterton is not for everyone and am leaving it off my personal list. By the way, my sister-in-law has recommended to me Chesterton’s Father Brown Detective Stories , which I have yet to try. If you’ve read Orthodoxy, what did you think of it? 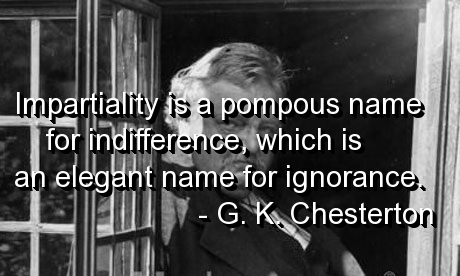 What did you like/agree or dislike/disagree with Chesterton about? This entry was posted in Christian Books, Non-Fiction and tagged C. S. Lewis, Calvinism, Chesterton, Elfland, John Piper, Orthodoxy. Bookmark the permalink.